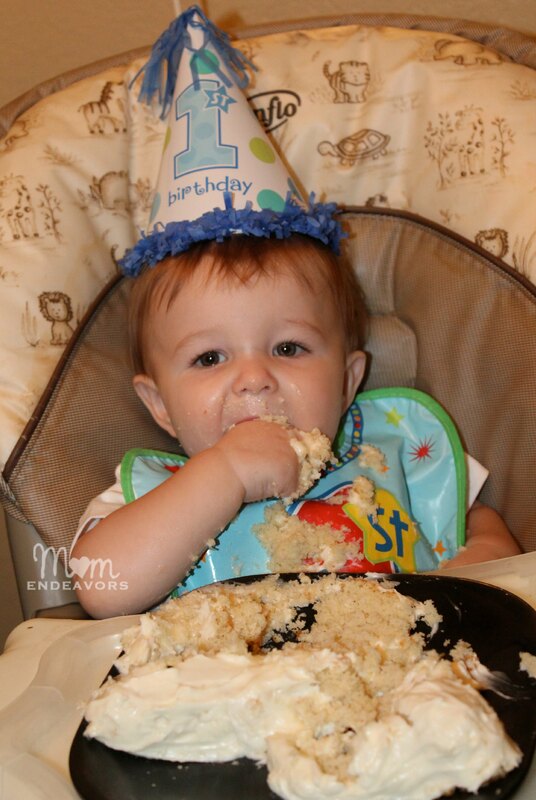 After our crazy month of August, I am so excited to finally be sharing all the fun from Baby Brother’s 1st Birthday party! Honestly, I had trouble coming up with the theme at first. I almost went with an owl theme and then inspiration struck while reading one of our favorite board books – Baby Beluga by Raffi (*affiliate link). It’s one of our favorite songs to sing. So, why not do a birthday party around it?! It’s a fun & unique birthday theme – and perfect for Baby’s 1st birthday! So, I went with it and loved the way it all came together! What really helped everything come together was finding the adorable beluga vector graphic that I was able to purchase for personal use (so sadly, no printables to share). Plus, we found adorable whale shirts (from Janie and Jack) that were perfect for our whale party fun! So, I based everything off of the graphic and the book. We started with some simple invitations… We kept the decor simple and fun with blue & white, a sea of balloons, and of course fun ocean animals (that we had around the house). We even happened to have a beluga stuffed animal that took center stage on the mantel. Plus, I made a simple photo banner to hang, which had a photo from each of Baby Brother’s first 12 months. Since we did an evening party time, dinner was a must and we had to have themed food, of course! 😉 I had so much fun coming up with ideas. 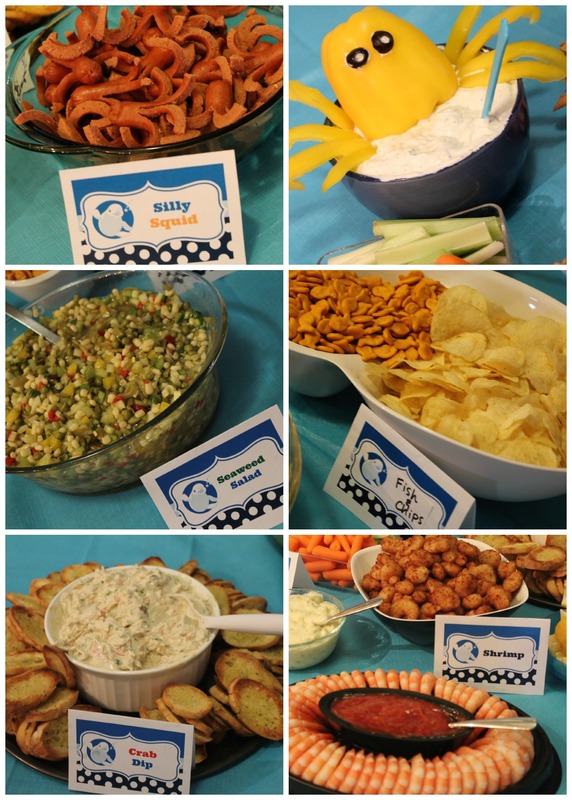 For dinner, we served shrimp (both popcorn & cocktail), crab dip, “seaweed salad“, silly squid (directions in this pirate party post), octopus veggie dip, “fish & chips”, and watermelon served in a carved whale tale watermelon. I think my favorite thing from the food though might have been the punch! 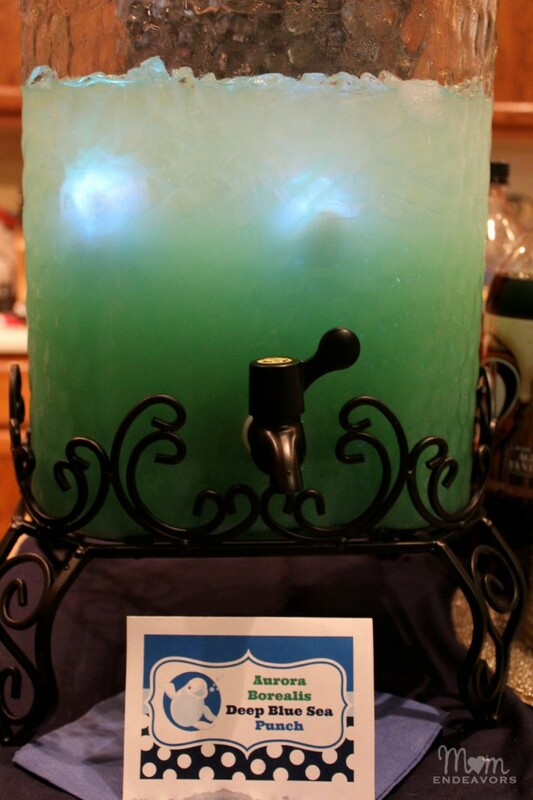 We did a variation of the green punch we frequently make (without the sherbet this time) with some blue raspberry kool-aid packets to make it a sort of sea green/blue color for the “deep blue sea”. But, we were able to call it Aurora Borealis punch with the addition of some super fun light up ice cubes! We had 4 in there that we had saved from some fun Disney events, but you can buy something similar at Amazon (*affiliate link) –>Litecubes® Flashing LED Multi-Color Freezable Ice Cubes So fun! After dinner then, we had to do a few activities! Baby Brother was a still a bit too young to participate, but he sure did try! The bigger kids had a lot of fun with everything though. First up, we had a craft station where the kids could make their own ocean scene on a piece of blue foam with fun stickers. Then, we played “pin the tail on the whale”. For that, I just hand sketched a beluga on an inexpensive white plastic table cloth and cut it out. 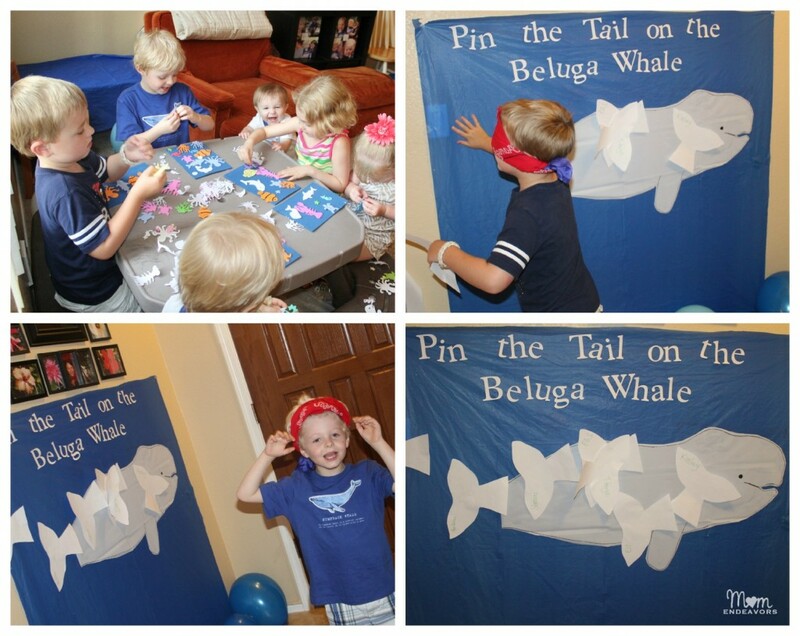 Then, each kiddo got a cut out whale tail to stick up. We also played “freeze dance” with the Baby Beluga song. The kids loved that! And, last but certainly not least, the dessert table – my favorite thing to do! 🙂 I made the beluga cake which was SO easy, especially compared to the big boys’ Bucky pirate ship cake! 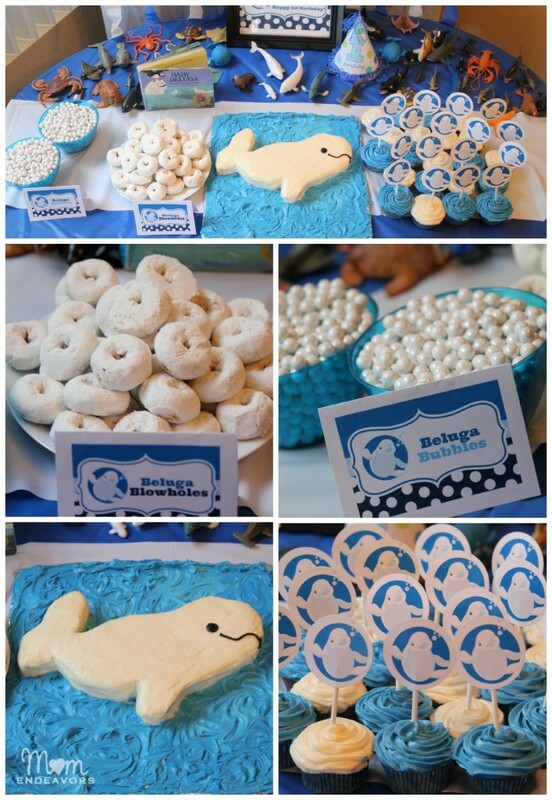 Then, we had cupcakes (with cut-outs of the beluga for easy & cute toppers), “beluga blowholes” (powdered sugar donuts), and “beluga bubbles” (these were white candies which you can buy at party stores or through my Amazon affiliate link –>Shimmer White Sixlets Candy). 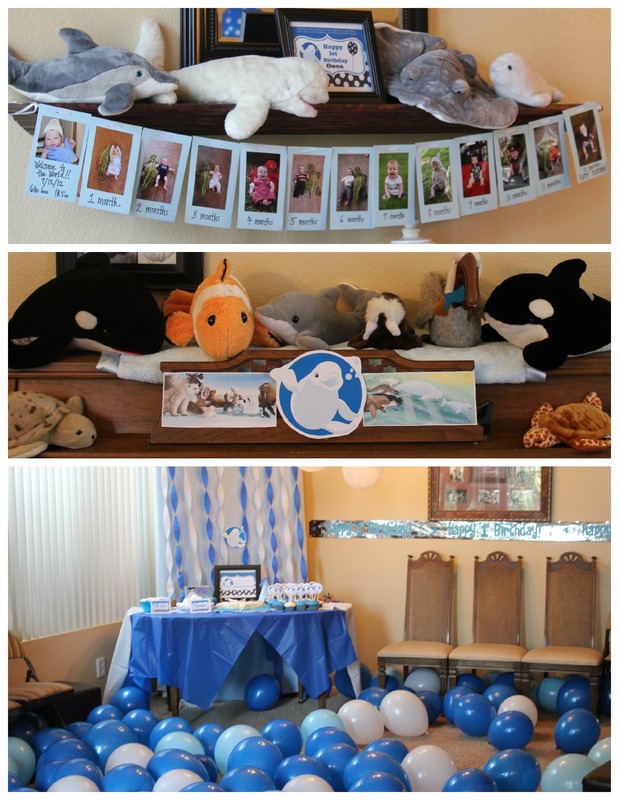 All of our fun ocean animal figurines were the perfect table decorations, with our Baby Beluga book too, of course! Baby Brother got a little whale tale for his smash cake and smash it he did! He was a little unsure about the whole thing at first (as it was his first taste of cake). But, once he got a bit in there and realized how yummy that homemade cream cheese frosting was, he started shoveling it in! 😉 It was such a fun night celebrating our this adorable little guy! I can’t believe it’s already been over a year since we were welcoming Baby Brother to the world. He’s taken his first steps since his party and is now a full-fledged toddler, walking everywhere and climbing! After our scare in the hospital last week, I’m extra thankful to have had such a fun party for him and be looking back on that now! Do YOUR kids like Baby Beluga? Oh my goodness this is the cutest birthday. Makes me want to have another child just so we can have this birthday theme. Haha! No more babies here! I still pinned this because it’s just the sweetest thing!!! You did such a fabulous job! I love creative birthday ideas and yours certainly fits that. It came together so nicely! 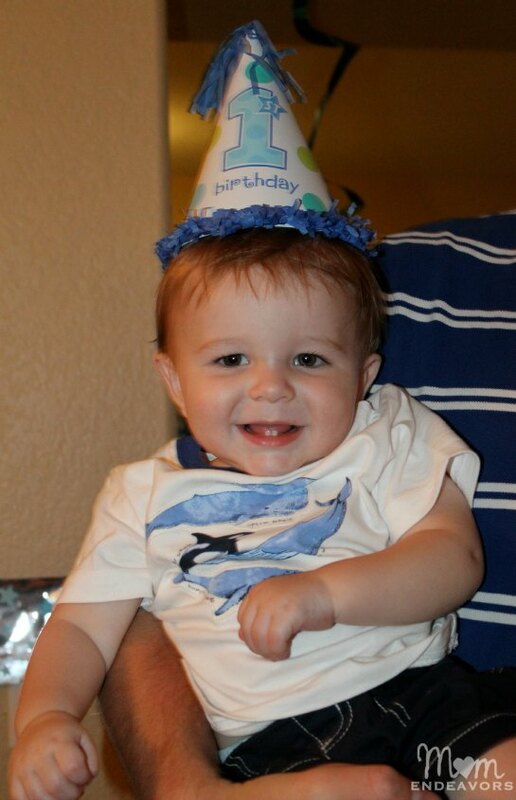 Adorable Party Idea for an adorable Baby Bother. 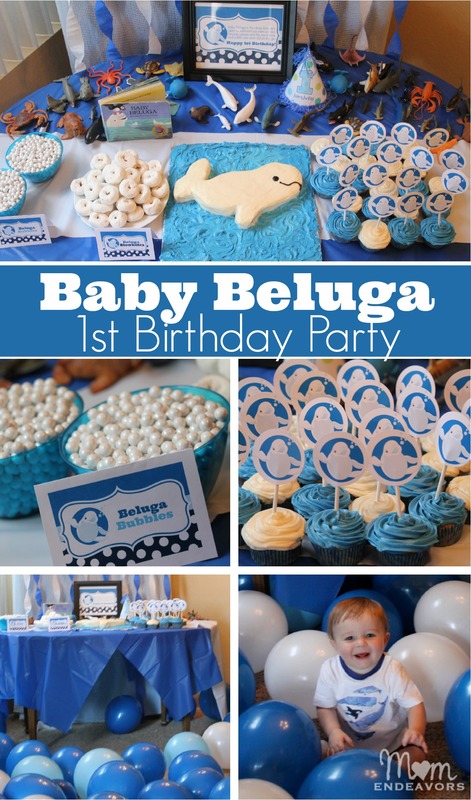 What a fun and creative Birthday theme idea, I never would have thought of it, but I love baby beluga! You did a really great job with everything. I’ve never heard of this book, but it made such a cute party! I love love love this!!! Not only because you did a fabulous job but because of how original and creative this is! Pinning! I’ve never heard of that character before, but how cute for a birthday theme! Love all the food items to go with the theme and the decorations. And that last picture – So Precious!! Awesome! I think you saved me! 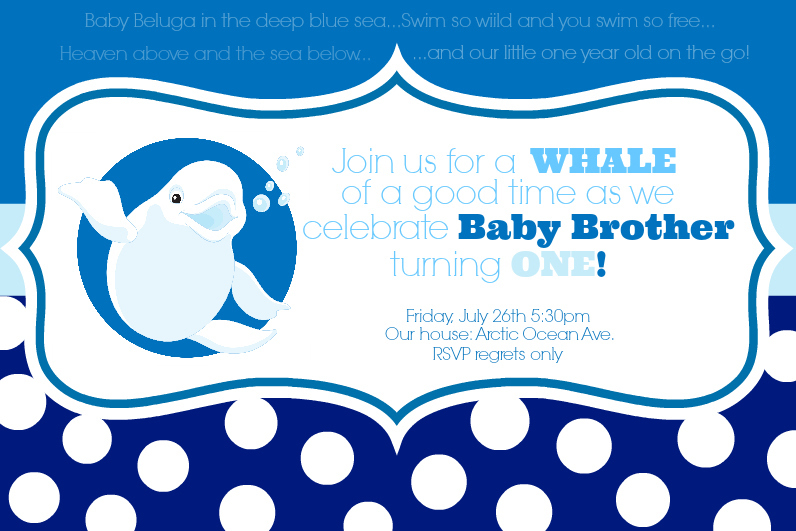 My almost 2 year old daughter is obsessed with Baby Beluga and just announced that she is having a Baby Beluga birthday party. I’m pretty creative when it comes to birthday parties, but all I could think was “well how am I going to do that?” You did a great job. Thanks for the inspiration! We just recently discovered Baby Beluga and we love it!! The song is so fun (not annoying like many other kids songs). This looks like a great party! Hi im suppossed to do a project on Beluga Whales, and i love the way you’re cake looks! Do you have a recipe for it?